Air source heat pumps are an efficient technology that uses electricity to both heat and cool a building. 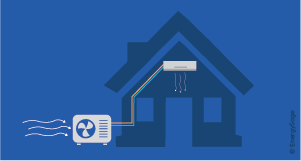 Learn all about air source heat pumps and whether they’re the right option for you. FAQ: Is buying air source heat pumps worth the upfront investment? Air source heat pumps typically cost more than traditional heating and cooling systems. A well-installed air source heat pump system is capable of providing 1.5 to 3 times the amount of electrical energy it consumes in the form of heat energy for your home. Lower electricity requirements mean lower energy bills overtime.